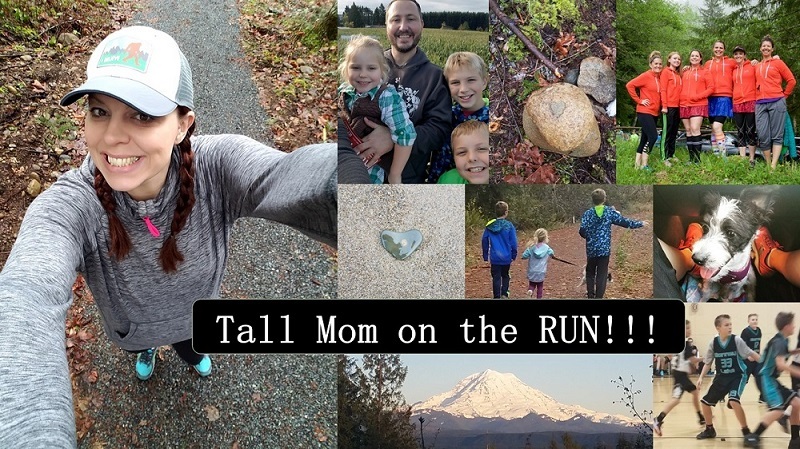 Tall Mom on the RUN: Stick and Stones . . . Stick and Stones . . . I set out on my run, 38 degrees and lightly raining, hoping to get in a few miles to prepare for a 5K run next weekend. To save time I opted to run in my neighborhood, passing a busy baby shower and more Seahawks flags that I could count. Ahead I saw 3 boys maybe 10-12 years old, at my pace I was bound to cross paths with them. I sped up to avoid getting in their way, as I did I heard "nice running lardo" by one of the boys as the others laughed. I cant 100% say they were talking to me, so I didn't turn to say anything, instead my pace quickened and I was transported back to age 13. One of my favorite things about running is interacting with people. In general folks will wave, pass a kind word, or flash a smile. I have been honked at, whistled at and received other suggestive comments from men, creepy yes, but I file those in my brain as compliments. You never know what you are going to get when you step out the door for a run. Overall the experiences have been about 95% positive... so why is it that I remember the negative?? While playing college basketball I was at the Freethrow line and 2 guys yelled "Hey 33 you are putting a little stress on your Nikes!" They were drunk, stupid and trying to get in my head, as an athlete I had to shake that stuff off. Today I remember that moment like it was yesterday, but I can't remember my best performances, the moments when I shined and the crowd cheered. The mind is a funny thing... Studies show that it takes 6 positive comments to erase 1 negative comment. As a society we are conditioned to fixate more on the bad things that happen to us than celebrate the good. What a BUMMER that is!! Words hurt whether you are 5 or 34, the sting is still the same. I cant control what other say but I can control my reaction. This "lardo" pushed the pace and finished strong, I took the comment and used it as fuel to push harder. Then when I got home I talked to my 8 year old about what happened, telling him that he needs to be careful with his words and how they impact others. Who knows if that conversation will sink in? It is possible the mother of the kid today has uttered the same words to her son. Here and there I say things I know I shouldn't and I realize it in the moment. This was a healthy reminder: 1. I need to watch my negative words because they have power 2. I need to always say the kind things that I am thinking because people NEED to hear it. What interactions have you had while running both positive and negative and how did it impact your performance? What a great post and soo true! Why is it so hard to believe the good things about ourselves? Great reminder! Great post! Those boys are just immature and need to be taught some manners! :-) We all know how beautiful you are inside and out! Keep up the good work Mel! I read that post on FB yesterday and was instantly mad/disappointed in those boys and their parents. Clearly, they don't have role models. Which is sad, very sad. However, you are the adult and I'm glad you used it to fuel your run. Remember how loved you are. Your beauty radiates from the inside to the outside. Your children would never say that to someone...THAT is what is most important. i have joined your feed and look forward to seeking more of your post. Take comfort in the fact that 99.9% of the population will never even attempt the things you have already done. They lash out because that is all they have. Words do hurt. It takes 9 good things to trump 1 bad thing said. I was running with my 14 year old and had a truck full of kids scream obscenities at me. I pretended like I didn't hear them. Austin my son didn't pretend. He started laughing at me and the name they called me. Sometimes you have to laugh because it does hurt not to. Never a dull moment out there! To be yourself in a world that is constantly trying to make you something else is the greatest accomplishment. See the link below for more info. Words are powerful. I often pray, "Lord put a gatekeeper at the door of my mouth." We just don't know what's going on in someone's life and how our words can affect them. Don't worry, I'm sure it's sarcasm. Like calling the 7ft guy Shorty, or the bald guy Hairy. Swiss watch brand Alpina Replica Watches continues development of its watches with the arrival at the end of the year Fake Breitling watches 2013, the Alpina Extreme Diver 1000 orange. Timer imposing 44 mm steel housing Replica Rolex uk water resistant 300 meters that houses the automatic mechanical gauge that displays its black dial particularly legible. You don't know this, but you have been inspiring me for 3 years! I took your 1000 mile challenge in 2011, and have ever since. I finally hit 1000 miles last year in 2013. This year I am on track for 1200! I just wanted to thank you. Quickly these many people were being successful suites overflowing with international awards together with patents just for timepiece layout combined with advancement around timepiece platforms. Ditesheim's technology don't replica U-Boat watches truly start with the store's Movado experience identify which inturn means "always throughout motion" for Esperanto. The precise name is not in the last adopted unless finally 1905. Until finally the present day, best imitation Panerai watches many for replica Tudor watches UK the runs with Movado devices, such like Juro together with Luno really are called from same foreign language. An instant look at many planet best wrist devices will talk replica rolex watches uk about the iconic specify. Throughout 1912 a fabulous Movado watch appeared, and name brand, by needing an uncommonly refined movement which cheap fake Tag Heuer watches has 'shaped' enhance the curvature on the folks activate. Dealkare is the best Home Shifting Services company with trustable and affordable price.we utilize high quality bundling materials for your goods.we giving fast service with safe and secure timely delivery to customer. If you are looking for an expert Website Design Company ITSWS gives reliable and best Website Design at direct costs and as indicated by customer basics in Lucknow city. Dealkare are always ready to pack move all your expensive items with safety, securely relocation services in Ghaziabad.